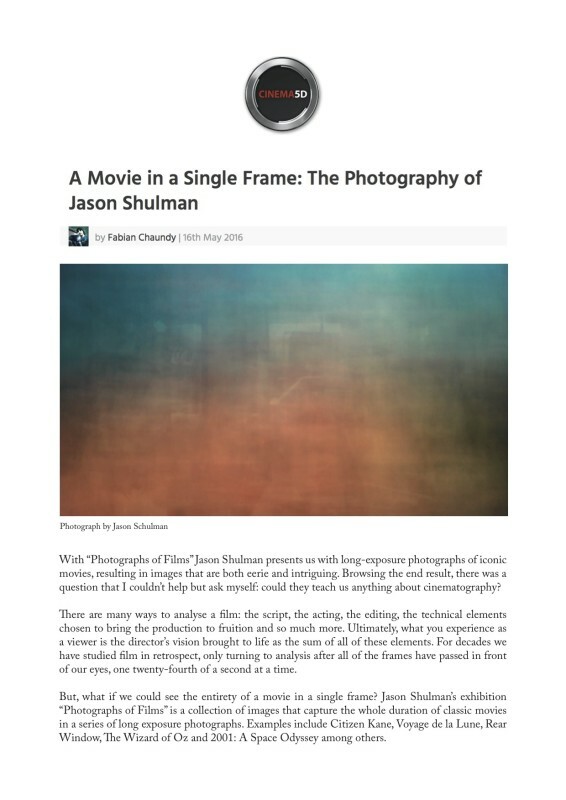 With “Photographs of Films” Jason Shulman presents us with long-exposure photographs of iconic movies, resulting in images that are both eerie and intriguing. Browsing the end result, there was a question that I couldn’t help but ask myself: could they teach us anything about cinematography? There are many ways to analyse a film: the script, the acting, the editing, the technical elements chosen to bring the production to fruition and so much more. Ultimately, what you experience as a viewer is the director’s vision brought to life as the sum of all of these elements. For decades we have studied film in retrospect, only turning to analysis after all of the frames have passed in front of our eyes, one twenty-fourth of a second at a time.